Hamburg's Palace Theatre is not going anywhere if owner Jay Ruof has anything to say about it. Ruof told the Village of Hamburg recently he will turn down a $225,000 state grant to renovate the 93-year-old movie house because the $75,000 he would have to contribute is too much money. But that doesn't mean the theater is in jeopardy, he said. He said his bank told him and his wife the only way to swing it was to refinance the mortgage for 20 years, and that was just too long a period with too many uncertainties for the 58-year-old. "We are three-and a-half years away from paying off the mortgage," he said. And those payments have become harder to manage in the past several years, as moviegoers don't have to leave their homes to stream movies on their 65-inch TVs. The drop in attendance is significant. About 48,000 people saw movies at the theater in 2015. Last year, that number had dropped to about 26,000, he said. And that's with the theater showing first-run movies. "The attendance has gone down so much. We kind of just make it each month," he said. There also have been questions raised about possible asbestos in the building, and the possibility that by undertaking renovations, sprinklers might have to be installed. Ruof said the building is grandfathered and does not have to install sprinklers, and a contractor indicated there is little or no asbestos that could cause an issue. But he did not want the village to lose the grant, so he contemplated the suggestion of special projects coordinator Paul Becker to consider selling the property. Ruof said he would ask $450,000, and the buyer would have to keep running the theater. "I love movies and I love old theaters. That's part of the reason why I'm hanging in there," Ruof said. "The theater does belong to the village; I’m a steward for it." What if someone offered him $1 million, but wanted to build a restaurant or apartments in the theater? "I would refuse it," he said. "It's sort of in your blood. I just assume everybody loves the theater as much as I do. I could spend all my time here." Meanwhile, Becker is looking for a new buyer or a model of ownership that would allow the theater to thrive. "We can't afford to lose this money," Becker said. "It keeps me up at night." 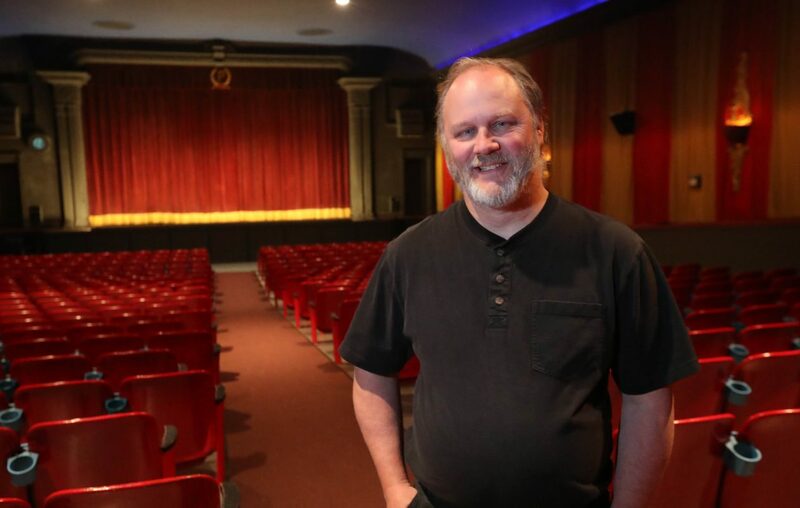 Edward Sharon, a SUNY Fredonia theater and dance professor and owner of Venture Productions at the Fredonia Technology Incubator, sees potential in the Palace, with its 600 seats. He would convert it into a hub for cinematic, performing and visual arts. "You're in essence opening artistic doors for the community rather than closing them," he said. "There's so much potential there." He also suggested partnering with Hilbert College or another college for interns. Ruof said the grant money would have been used for roof repairs, updating the existing heating and air conditioning, moving the concession stand to the opposite side of the lobby, and construction of three restrooms where the concession stand currently sits. He has ideas to increase attendance. He said he plans more concerts and live events. The theater also is rented out most weekends for birthday parties. A Laurel and Hardy "enthusiasts" club is in the works, and he would like to offer weekly classic movie matinees. Opened in 1926, the building was designated a local Hamburg landmark in January. Any future renovations to the exterior will be reviewed by the Historic Preservation Commission. "It's important to our village, it's part of our history, it's part of the fabric of our village," said Damon Ayer, chairman of the commission. The building would need state and federal landmark status to receive tax credits on renovations, Ayer said. Ruof said if it comes down to it and it made financial sense, for the future of the Palace, he would sell it. "But I wouldn't be running the theater I love," he said.